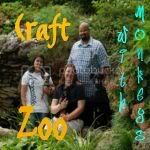 Find Journeys of The Zoo on Google+ Journeys of The Zoo: The Crafty Zoo is Guest Posting at Journeys of The Zoo. My Friend Kaycee who blogs over at Crafty Zoo with Monkeys is guest posting at Journeys of The Zoo and sharing something that you never see over here and that is... Craftiness! Hey Everyone! I am so excited to be joining up with my fellow Zoo Keeper today! I've got my own Zoo, Craft Zoo with Monkeys and would love for you to stop by and visit! Our Monkeys always love comments! Anyway, a little about me and then I'll get to an adorable project for ya. Our Zoo is in Arkansas. We call it our Zoo because my daughter is nicknamed Monkey, we have a roommate named Bear, two chihuahuas, a great dane, 1 frog, 3 koi, and a goldfish! Monkey is pushing for a cat, but she is losing, and Chief Zoo Keeper (my hubby) is wanting an African Grey.... He is also losing.... I wanted a horse.... Yep, I'm losing too! Not quite enough space around here! Now, on to that project! I made an adorable little decoration for a Luau party, but it could go with any beach theme you'd like. You could do the same thing with candles or almost any theme you'd like. It was a huge hit and everyone loved it. I will admit that sometimes I love getting those little compliments from people. LOL. Thanks for taking the time to visit today and Sarah, thank you so much for allowing me to host my little exhibit at your Zoo!!! Tough finding things for you and your kids to do this summer? Get these few items together and A-Luau to your next party. Or, better yet, send them off in search of the items and it could take all day. Be sure to send me pictures of your completed projects so that I can post them. And compliments you should get Kaycee! Thank you so much for infusing some creativity into this blog. Just what the doctor ordered. Be sure to send Kaycee some love by leaving her your comments at the bottom of this post. Better yet, let us know what other crafty ideas you'd like to see and hopefully Kaycee will come back! Thanks to you for letting me guest post! I really enjoyed 'visiting' your Zoo!!! Hope you all have an awesome day! Thanks for introducing us to Crafty Zoo with Monkeys! LOVE that Luau idea, so creative and fun!